Note from Lauren: I invited my friend Melissa Gallico to share this eye-opening article with you today. Melissa is doing incredible research and education around the health effects of fluoride, and heads up a petition to ask Congress to stop promoting fluoride. Additionally, this is the filter I use to remove fluoride from my drinking water. It’s the most affordable and accessible option I’ve found for fluoride removal. Acne is the most common skin condition in the United States, affecting an estimated 50 million Americans each year. Yet when it comes to identifying the root cause of this common condition, many stones are still unturned. 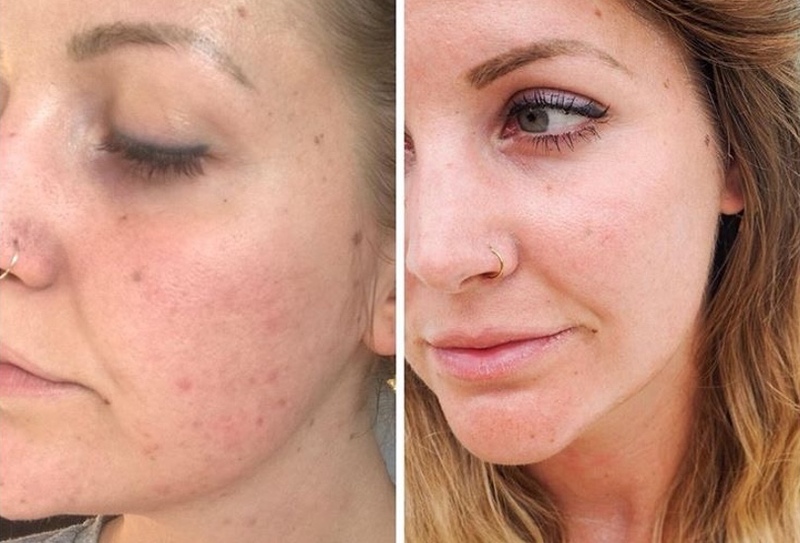 In 2002, researchers at John Hopkins University conducted a review of the scientific literature on acne from the second half of the twentieth century and found that 99.6 percent failed to even mention diet. Since then, thanks in large part to the paleo movement, more researchers have focused on the dietary causes of acne. However their studies mostly center on sugar, the primary culprit in obesity and heart disease. None of these researchers focus on fluoride as the root cause of the modern acne epidemic. 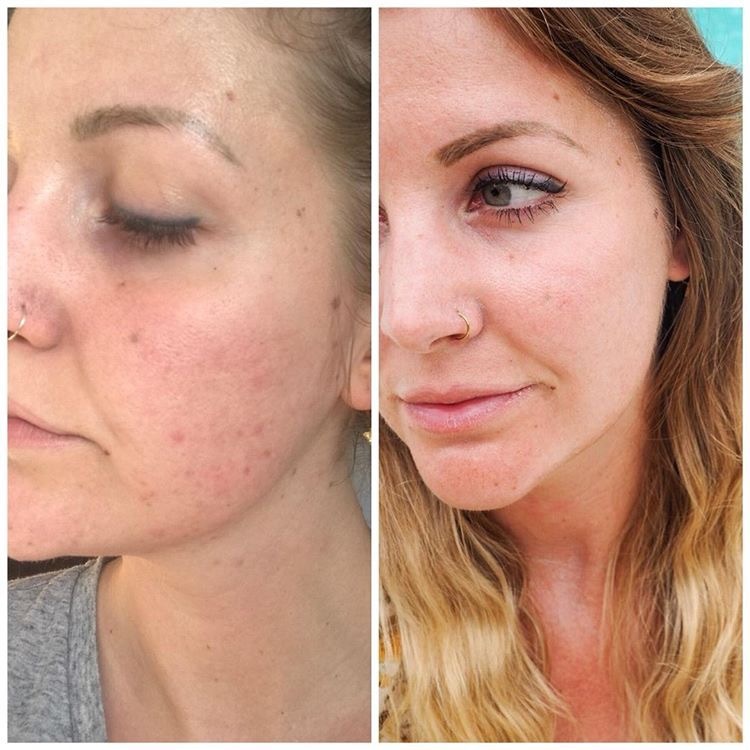 Here are five reasons why they should — and why you should too if you if you are looking for real answers to chronic adult acne. In their study of traditional societies in the Amazon and Pacific islands, Loren Cordain and his colleagues make clear that entire societies of people never experience acne. Dr. Cordain attributes this phenomenon to their low-glycemic diets which stand in stark contrast to the high sugar diet most westerners consume. But a more subtle difference is that these traditional societies also consume a diet that is naturally low in fluoride. The mean fluoride content of freshwater is 0.05 ppm. This is fourteen times less than what government dentists recommend for artificially fluoridated water programs across the United States. The traditional diets described by Dr. Cordain and his colleagues are also low in fluoride because they do not include fluoride-based pesticides or black tea. The camellia sinensis plant used to produce tea leaves is the only edible plant that uptakes significant amounts of fluoride directly from the soil. Topical exposure to fluoride from toothpaste and dental treatments has been proven to cause an acne-like skin condition around the mouth and chin called perioral dermatitis. But ingesting fluoride can cause acne, too. 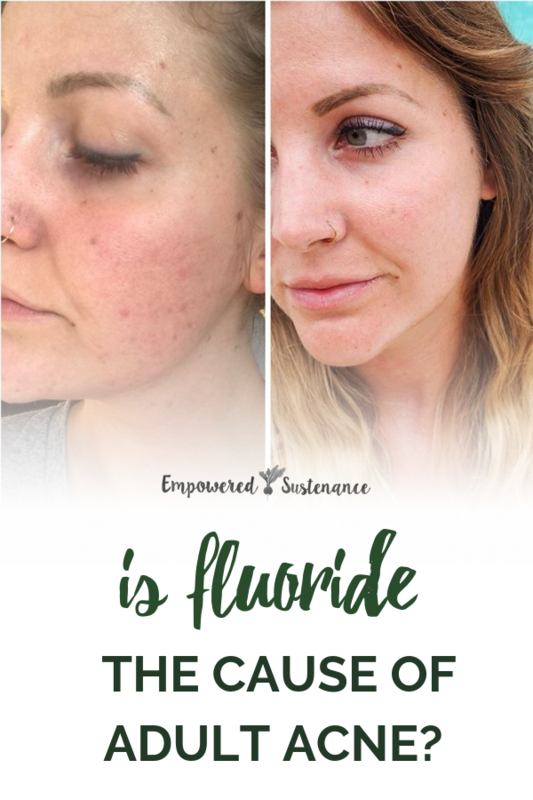 I know this because I struggled with cystic acne for nearly 20 years before I figured out the root cause was fluoride in my diet. Throughout my career as an intelligence analyst with the military and FBI, I had the opportunity to live in several non-fluoridated countries. It was the experience of moving back and forth between fluoridated and non-fluoridated regions that caused me to first suspect fluoride as the culprit. 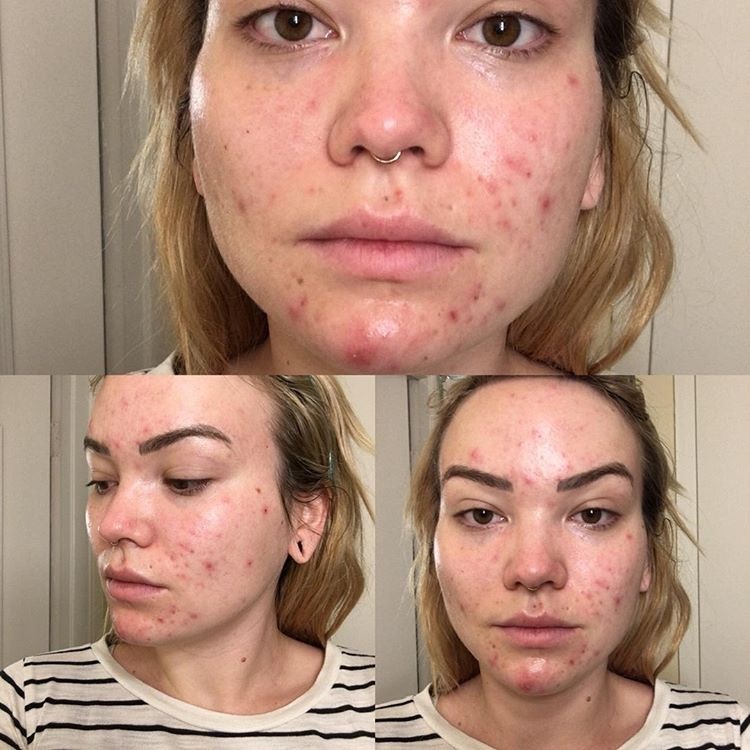 If my acne was genetic or truly incurable, as some dermatologists claimed, why was my skin effortlessly clear within weeks of moving to certain countries? Through careful analysis and observation, I was able to heal my acne completely by learning how to avoid excess fluoride in my diet. The reviews on Amazon and elsewhere for my book, The Hidden Cause of Acne, are evidence that I am not the only person with this condition. 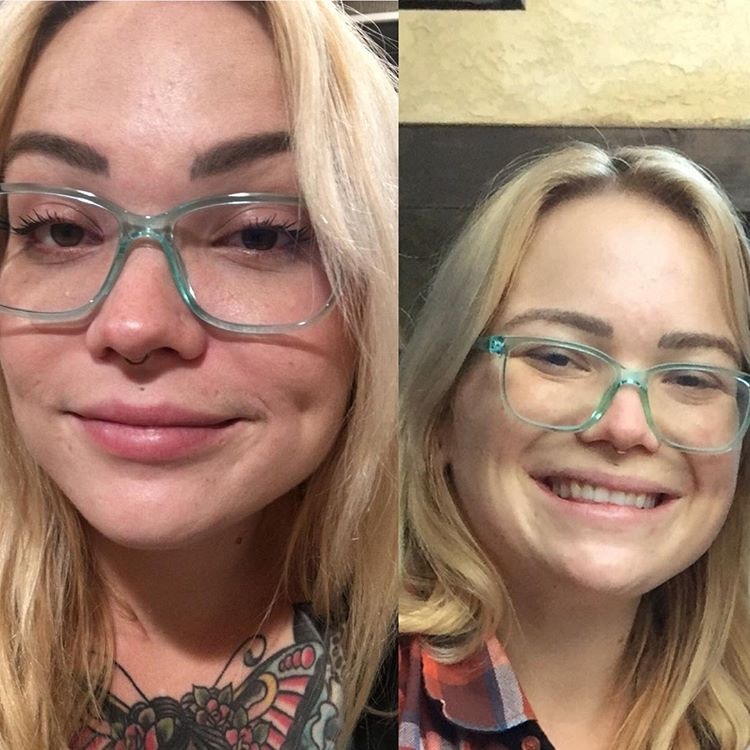 Below are before and after pictures of Amy Saunders, founder of Skyn Therapy. Even though Amy lives in a non-fluoridated region of England, she was experiencing fluoride-induced breakouts from the fluoride contained in common products like toothpaste and non-stick cookware. Jennifer Cramer, the Mindful Nutritionista, did not realize the high amount of fluoride she was consuming from homemade kombucha and other sources was causing her skin to break out. When she reduced her fluoride intake, not only did her skin clear, but the ovarian cysts and migraines she experienced on a regular basis also disappeared. After writingmy book on fluoride-induced acne, I later learned the causal relationship between fluoride and acne was observed decades earlier by an allergist named George Waldbott. World-renowned for discovering the link between emphysema and smoking, Dr. Waldbott spent several years studying people like Amy, Jennifer, and myself who are hypersensitive to fluoride. “Skin eruptions” were just one of the many negative side effects he documented in his patients. You might be asking, if fluoride-induced acne is so common, why has it been overlooked for so long by government health authorities? Most dermatologists have not heard of Dr. Waldbott’s double-blind, placebo-controlled studies showing that a significant portion of the population experiences acne from the amount of fluoride added to the public water supply. Negative studies on fluoride have been intentionally suppressed because they run contrary to powerful special interests. There is a reason Waldbott’s book is called The Struggle with Titans. For decades, proponents of fluoridation have relied on the argument that decades of research prove the fluoride added to water is completely safe for everyone. But when were the decades when they did the actual research? Fluoride is not a mineral nutrient like calcium. It is a halogen, like chlorine and bromine. The human body has no known requirement for fluoride and, like chlorine, certain forms of fluoride are known to be toxic and highly volatile. If you look for official comprehensive studies on the longterm safety of artificial water fluoridation, you will soon discover they do not exist. This is because the primary story of fluoride is not about cavities or public health or even science. At its heart, the story of artificial water fluoridation is a pollution story. In the mid-twentieth century, fluoride was a leading air pollutant. A common element in the earth’s crust, fluoride is a toxic byproduct of many industries, from aluminum plants and fertilizer factories, to brick and tile manufacturers. At the time artificial water fluoridation was first being studied as a solution for dental decay, corporations were facing litigation from coast-to-coast regarding damage caused by fluoride pollution to agriculture, livestock, and human health. To mitigate their vulnerability to lawsuits, these same corporations funded studies at university research centers to prove that fluoride is safe. They even joined together to form a self-described “Fluorine Lawyers Committee” and hired their own medical advisory board to direct university researchers. Dentists who supported fluoridation had their research funded and were promoted to positions of authority while those who voiced opposition or urged caution were ignored or forced out. A corporate-funded dentist was the first to propose adding fluoride to the water supply, and a lawyer for the biggest polluter was head of the U.S. Public Health Service when fluoridation was prematurely endorsed by the federal government. At the time, government dentists were only 5 years into a 15 year trial to prove fluoride’s efficacy at reducing dental decay. After extensive damage to livestock and agriculture, EPA now sets strict regulations prohibiting the release of fluoride pollution into the atmosphere. Instead, this same toxic “byproduct” of industry is packaged and sold to municipal water utilities for addition to public water supplies. Approximately 90 percent of the fluoride added to water is a byproduct of the phosphate fertilizer industry. Government authorities advocating for fluoridation argue that the dose makes the poison, and that the amount of fluoride added to water is too small to cause harm. They are quick to point out that fluoride is naturally occurring in some water supplies, and that artificial water fluoridation programs are merely adjusting the level to the dose they deem optimal. But as our tragic history with other natural but toxic elements like lead and mercury demonstrates, government regulators have a tendency to underestimate and oversimplify the risk to public health when large financial interests are at stake. Individual reactions to fluoride depend on a variety of factors. It is well established that fluoride bioaccumulates in bone and can cause symptoms of arthritis over time. The National Research Council estimates the half-life of fluoride in human bone is twenty years. That means half the fluoride sequestered in your bones today will likely still be there twenty years from now. I suspect one of the reasons I am hypersensitive to fluoride is because my dentist prescribed a fluoride supplement for me as a child when my teeth and bones were developing. Other signs the indiscriminate dosing of fluoride through the water supply is inappropriate include the fact that fluoride is a known endocrine disruptor. It has also been shown to depress thyroid activity and has even been used as a drug to treat hyperthyroidism. The highest concentrations of fluoride in the human body were found in the pineal gland, a brain organ that produces melatonin and regulates sleep. Even if you are skeptical of the scientific argument against artificial water fluoridation, it is easy to test for yourself if your adult acne is caused by fluoride. Simply switching to fluoride-free drinking water and toothpaste for one month should be enough to see a dramatic reduction in breakouts. If you notice improvement, the next step would be to eliminate other excess sources of fluoride from your diet, such as black tea, food and beverages made with fluoridated water, and the common culprits for fluoride-based pesticides. Do you think it is possible your adult acne is caused by fluoride? Please share your thoughts below. 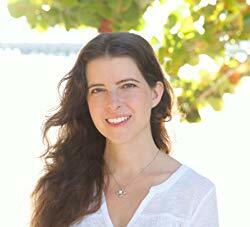 Melissa Gallico is the author of The Hidden Cause of Acne and F Is for Fluoride: A Feasible Fairytale for Freethinkers 15 and Up. She is a former military intelligence officer, Fulbright scholar, and intelligence specialist at the Federal Bureau of Investigation where she instructed classes for FBI analysts at Quantico. She graduated with honors from Georgetown University and has a master’s degree from the University of St. Andrews in Scotland. For help reducing your exposure to fluoride, become a member of Melissa’s private Facebook group, Fluoride Free Faces, or visit www.HiddenCauseofAcne.com. To join her in the effort to end artificial water fluoridation, visit www.ProjectFree.Me. You can also connect with @MelissaGallico on Instagram or Twitter. I just switched toothpastes a week ago, using a fluoride Colgate brand. Within two days, I had lower lip perforation and perforation of skin on the sides of my mouth at the chin. It looked terrible. I immediately stopped with the toothpaste and a lip balm that I had introduced to my daily routine three weeks before. I am happy to say that the lip perforation has subsided 90% after 5 days of non use. But I still am aware of the darkness and perforation on the chin area. I am quite happy Lauren chose to share this article. I will be joining the fluoridefreefaces group and staying abreast of all literature on this insidious chemical. What a threat!! Excellent article, Lauren – so glad to see the word is getting out. Thanks to Melissa, I discovered fluoride is a huge contributor to my problem. I now avoid it all costs but always know when I make a mistake. My water is not fluoridated at home, but just a road trip 45 minutes to another state caused me two weeks of grief over the summer. And I currently have two cysts because I forgot to ask for no ice at the bar at a wedding in another state over the weekend. I’m a big tea drinker and super curious to learn more about the fluoride in black tea. Do you have any more information about this? Thanks! I too am wondering about black tea. I am a huge tea drinker and this has me thinking! I am also a black tea drinker and I gave up tea after learning about it’s fluoride content from Melissa. It’s only been a week — not enough time to see if it’s made a difference with my skin. I too have found that I am hyper sensitive to fluoride. Months ago I switched to a gum strengthening toothpaste. I also got Invisalign braces the same time. My face became swollen and heavy breakout almost hive reactions started. I switched face cleansers, soap, makeup, everything I could. Finding a slight allergy to the latex bands in my mouth, I thought that would solve it. It took down the swelling but the rash and breakouts near my mouth got worse, and spread to my cheeks and forehead. One morning I looked at my toothpaste and noticed the fluoride level seemed high. I compared it to my husbands normal brand and it was over twice the amount. Keep in mind, with my braces, I was brushing my teeth and Invisaligns up to 5 times a day. I was poisoning myself!!! I went and tried a fluoride free natural toothpaste and within hours I was feeling better. In a couple days all my hives disappeared. It is a real thing, and dangerous. Your body trying to fight off the toxin is a constant drain. Thank you for your article, bringing awareness! Thanks for your amazing research! Whenever I travel to remote places, my acne does not exist. I currently filter my water with a Berkey filter that has fluoride filters. Do you think that it’s strong enough? Yes, that’s the filter I use and it is thorough in removing fluoride. You might also be impacted from the fluoride in your shower/bathing water, but I’ve not found an accessible option to remove that.